Can such attractively priced studio monitors really do the job of presenting your mixes accurately? The Neutrik Combo socket on the rear panel can accommodate a jack or an XLR plug, and an input-gain trim knob allows the user to set the speaker's operating level. 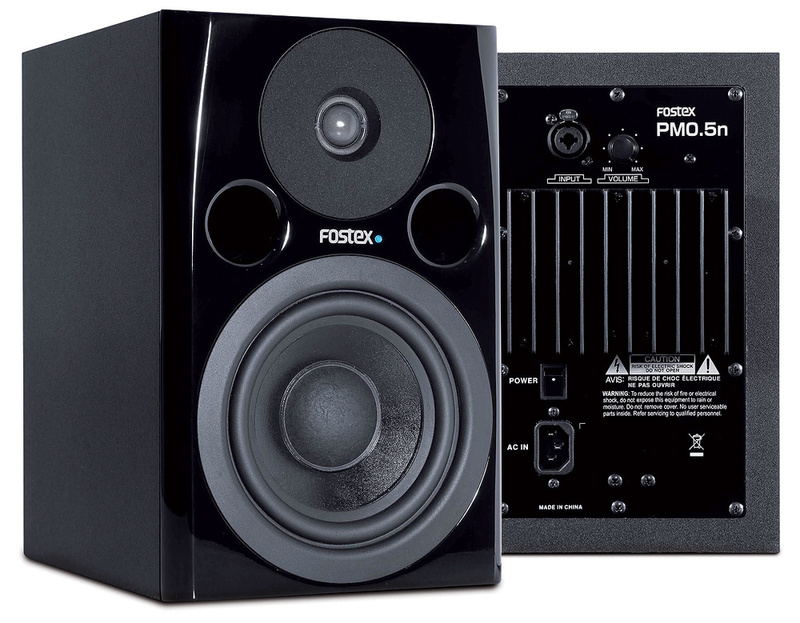 I've always had a soft spot for the less costly Fostex monitors, as they tend to perform extremely well within their price range, so I was keen to try out their new PM0.5n, which follows up the smaller PM0.4n model, which we reviewed in our February 2011 issue. As with previous members of the PM series, the PM0.5n is a two-way, active, nearfield monitor, in this case designed for use in small programming rooms and home studios. It's based around two newly designed drivers that are arranged symmetrically, so there is no difference between the left-hand speaker and the right. The 130mm woofer's cone is formed from a mix of cut and milled aromatic polyamide fibres, impregnated with resins to improve stiffness and damping. There's also an olefin film thermally bonded to the cone's surface, with a view to controlling the driver's frequency response, as well as maximising its long-term mechanical reliability. A centre dust-cap covers the front of the voice-coil assembly, and is made from resin-impregnated cellulose. The cone itself sits in a roll-rubber surround. Handling the highs is a 20mm tweeter, the soft dome being made from cloth and laminated with a polyurethane film, to achieve physical stability without adding much weight. The tweeter and woofer are powered by a 70W amplifier, whose power is split equally between them via an active crossover. Both drivers are mounted in a very stylish piano-black baffle (though you can also order the speaker in white, as the PM0.5nW), and are set back in machined recesses, so that they sit tidily flush. The baffle's edges are rolled, which minimises edge diffraction. With the exception of the glossy baffle, the cabinets are made from particle board covered in a black plastic foil. The cabinets are ported to maximise low-end efficiency, while the two frontal exits are flared to reduce air-flow noise. The dimensions of the speakers are 280 x 181 x 260mm (HxWxD), and each monitor weighs 6.5kg. A blue LED on the front, next to the central Fostex logo, illuminates when the speakers are powered up. Turning to the rear panel, the mains power comes in on the usual IEC socket, with a power switch just above it, while the signal input is via a balanced Neutrik Combo connector that can accept either a jack or an XLR plug. There's an input-gain trim, but as this is a smaller monitor with limited bass extension, there are no additional controls for changing the HF/LF balance, or for adjusting the bass response to suit the speaker's position in the room. Finally, a finned heat-sink is fixed to the rear panel to aid in cooling the amplifiers. Given the small size of these speakers, their frequency response is actually pretty respectable, extending from 50Hz to 20kHz (±2dB, measured free-field), with LF 10dB down at 40Hz and HF 10dB down at 22kHz. There's no figure provided for their maximum SPL capability, but I found them to be adequately loud: I certainly had no problem operating them at a comfortable monitoring level, and even pushing them beyond this elicited nothing worse than a slightly reedy tonality from the tweeter. At sensible listening levels, and with the speakers positioned up to around a metre from the monitoring position, the bass end was satisfyingly solid, albeit a little 'plummy', due to the cabinet's port resonance being used to make the best of the low end. The mid-range and high frequencies were even and detailed without sounding aggressive, and the stereo imaging was also very good. 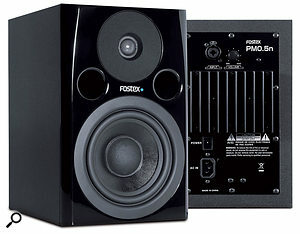 These are all the attributes I've come to expect from the monitors in Fostex's PM series. They have a good all-round tonal balance, and the inevitable design compromises have not been allowed to have a serious impact on the audio quality. Of course, there are limitations, such as a modest maximum SPL and a slightly under-damped bass end, giving rise to some overhang on kick drums and so on. These are unavoidable when designing small speakers, however, and the main point to make here is that there's nothing so far out of kilter that your ears couldn't compensate after listening to some commercial material over them. Overall, the PM0.5n sounds like a very 'grown-up' little speaker. If you're shopping for smaller monitors while keeping an eye on your budget, it should definitely be on your list of choices to consider. There are now quite a few smaller active monitors at the lower end of the price scale, such as the M-Audio Studiophile AV40, the Alesis M1 Active 520, the ESI nEar08 Classic and the Samson Media One 4a. The KRK Rokit RP5 G2 is a little more expensive, but well worth auditioning. Well-balanced tone, with a more solid-sounding bass end than you might expect from such a small speaker. No obvious cons at the price that aren't shared by all compact monitors, specifically the tuned ports that improve the bass efficiency but at the expense of some low-end tightness and control. Given their cost and physical size, these little monitors perform really well, giving you a pretty accurate idea of how your mixes actually sound. £378 per pair including VAT.